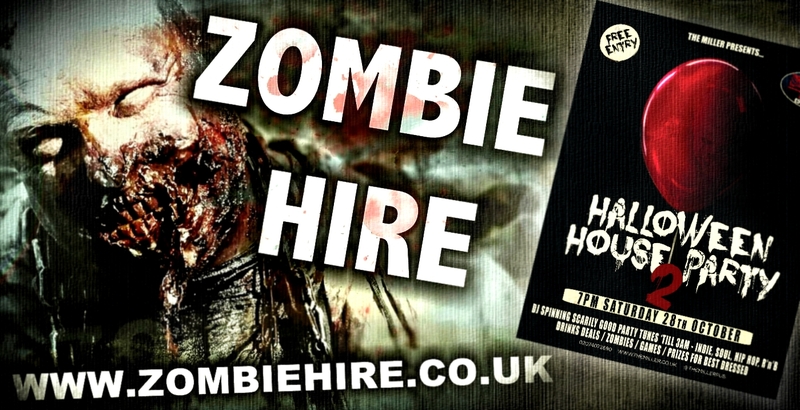 This Halloween My big scary Zombie Hire Zombie will be returning again to the awesome The Miller in London for the 'Halloween House Party 2' it's going to be epic! I'm looking forward to hearing screams and having lots of Halloween selfies. It's time to party! Wow, The Miller 2016 Halloween House Party in London was bursting with lots of energy as the DJ's played a killer set dressed up as skeletons! The wonderful bar staff worked hard as they kept the drinks flowing for the party. My big scary Zombie Hire Zombie got to scare and pose for lots of Halloween selfies, everyone had such a fantastic night! Check out this goretastic set of Zombie Wedding Engagement photos for Leia & Torsten. It was great to be hired as a zombie complete with dangling chains for this really lovely couple and in such a pretty location in London too. My big scary zombie hire zombie was out lurking in the crowds of the 'Bay Day Music Festival' held at The Golden Fleece Pub in Chelmsford, Essex. Zombie hire was very pleased to have been invited along to help entertain the guests and help raise lots of money for the British Heart Foundation (BHF) and Farleigh Hospice charities. Penguin Platform filmed a promotional video for Charlie Higson's latest book: THE END with YouTuber, actor and TV presenter Mawaan Rizwan. I was called in to add an infectious zombie look with a little special effect makeup to Mawann. My undead crew of Zombie Hire Zombies returned to be alongside The Walking Dead comic artist Charlie Adlard to support him on the A Place in Space trading stand at the London Super Comic Convention (LSCC) held in the award winning ExCel exhibition venue. The Zombies got plenty of screams and had lots of selfies with those brave enough to pose with them. They even did a little filming with the guy's from The Movie Maniacs. A few months later the Zombies also appeared inside a special Slipknot collectors edition of Metal Hammer magazine (issue 269 May 2015) with exclusive fold-out cover art designed by Charlie Adlard. Aura Films micro horror short film has been selected to be screened at several film festivals Worldwide. Fanta's promotional Zombie infected social media platforms at Halloween with the #HelpKen viral product campaign. Several fake news videos were released along with a 'Halloween Party Hacks' video with youtuber Casper Lee and a Halloween makeup tutorial with youtuber Velvetgh0sht. Zombies for hire, You can hire my gore-tastical Zombie Hire Zombies. Remember, Zombies are not just for Halloween! I was booked as a special guest in the horror zone demonstrating my zombie special effects make up at the first ever WYNTERCON in Eastbourne back in 2014. It is a great Sci-fi, Fantasy and Horror Convention and is growing bigger every year. My zombiehire.co.uk zombies invaded MCM Comic Con in London on sat 24th May 2014. It was a gore-tastical time making people jump and scream as they posed for Zombie selfies with us. We even got some zombie hugs near the end of the day! ITV FIXERS short film to show what it's like to be the target of racist bullying. FREE COMIC BOOK DAY at ACE COMICS in Colchester, Essex had a steady stream of comic lovers of all ages waiting to grab their share from the 60 comic titles like 2000 AD, Steam Wars, Zombie Tramp and The Smurfs. Plenty of charity raffle tickets were sold with the help from characters like Leather face, The Doctor and the Joker. I also created a couple of zombies to keep our sheriff on his toes as I transformed a handful of brave customers into the walking dead. It was great fun and a very successful day, with lots of smiles and laughter. CURSED - Essex's number one Halloween event. Dare you visit this multi award winning scare event in Essex? If you do, you might just catch me in its dark twisted shadows with Team Kinetix waiting for our next victim! Fright Night - Hylands House, Chelmsford, Essex. Great location for a spooky Halloween event where I will be doing some special effect make-up and also scare acting with the awesome guys from Team Kinetix. Halloween at Ace Comics in Colchester, Essex is the place to be for a treat! They have free comics to give away as part of the Halloween Comicfest that includes Batman, Spiderman and even My Little Pony! Plus there are lots more comics to chose from. There is also a kids Scooby Doo monster drawing competition which sounds great fun for all the little monster makers. I will be on-site doing some Halloween make-up so watch out for those pesky Zombies!! A free day out in Colchester town not to be missed. The shopping centre was invaded by superheroes and scifi movie characters in this fantastic charity event in aid of St Helena Hospice and Colchester Hospital Charity. I was very proud to be supporting Invasion Colchester with some of my blood dripping zombie creations. Check out the great video below by our good friends at Aura Films from 2012. The picturesque Quay Theatre in Sudbury, Suffolk was infested with around sixty blood splattered volunteer zombie extra's for the short film "Opening Night of the Living Dead". The film is based on a very successful stage play from the 2009 Edinburgh International Festival by Joshua Dickinson. I worked along side the wonderful Allison Boyd and we had lots of fun between us turning the extra's into the walking dead!